Jullian Nazzaro had her career mapped out in the third grade; she wanted to be a veterinarian. Her time in the Adventures in Veterinary Medicine (AVM) program at Cummings School of Veterinary Medicine at Tufts University convinced her to make her childhood dream come true. The AVM program allows participants to learn about the wide variety of careers available within veterinary medicine and discover first-hand what attending veterinary school is really like. 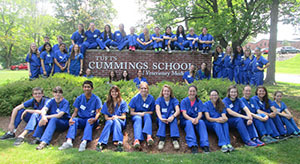 Sessions include lectures by Cummings School faculty and veterinary students, hands-on laboratories and demonstrations and activities with animals. AVM sessions are held in the spring and summer for middle school, high school and college students and adults. The schedules and programming differ by age group but have a common purpose: to provide those curious about veterinary studies a dose of real-life experience. Jullian, 17, a senior at North Andover High School in Massachusetts, attended the two-week high school residential program last year. Through her experiences, she came away more hopeful than ever that her name will one day be followed with DVM. Jullian especially enjoyed the chance to learn how to suture, in this case, on bananas. Once practiced and mastered on living creatures rather than tropical fruit, these suturing skills will come in handy when she fulfills her dream of specializing in small animal surgery. 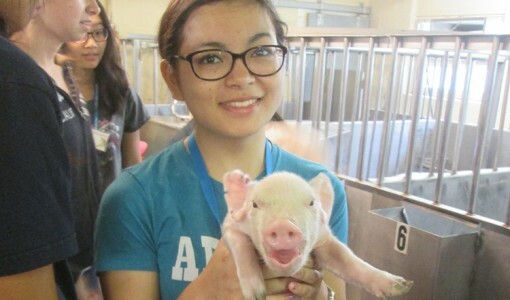 Jullian has worked hard to gain hands-on veterinary experience. For the past two years, she interned over the summer at a veterinary school in Japan, where she has family. She is passionate about animals and their well-being. As a lifelong animal lover, she has a cat, two dogs, a rabbit and an umbrella cockatoo. She developed a bond herself with her fellow Adventures in Veterinary Medicine participants, from across the country and from Honduras and France. They talked about their schoolwork and their experiences. Many of them volunteer at animal shelters, as she does at the MSPCA in Methuen, MA. As a volunteer at the MSPCA, Jullian enjoys working with the dogs with mild behavior problems. She strives to help them relax and calm down by spending quality time with them. In the future, she would like to attend Tufts University as an undergraduate, which she hopes will lead her to Cummings School. She speaks Japanese and English and is learning German. She hopes that these language skills and her experiences with various cultures will help differentiate her as a candidate, along with her animal experience both in Japan and stateside.